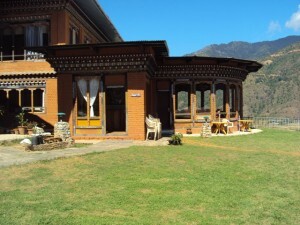 The resort is located 20 minutes from the airport in Paro on a gentle slope overlooking the picturesque Paro valley. The meandering Paro River and the rice fields form an agrarian topography that is beautiful to the eye and calming to the mind. Dhey Kyed in Bhutanese means wellbeing and peace. And that is just what we hope to offer you during your stay here. Our dedicated staff will strive to offer the unobtrusive services to our esteemed clients with traditional warmth and hospitality. The resort was built keeping in mind the vibrant and colorful Bhutanese architecture and modern comforts. It has three executive rooms, two deluxe rooms and seventeen standard rooms with comfortable toilets. It also has two single rooms with separate individual bathroom. The rooms are well equipped with necessary facilities like TV, telephone, heating system and comfortable linen. Herbal toiletries exclusively made for the resort are provided. Complimentary coffee and tea are available in the room. Large windows and independent balcony allow breathtaking panoramic view of the beautiful Paro valley from the rooms. The resort also offers a fully equipped conference hall which can accommodate 40 participants. The hall can also be used as a dance hall for casual parties. In addition to cable TV, international dialing facility, fax and photocopy, the resort has a very good business centre with broad band service. Foreign currency exchange, laundry and car rental services are also offered. The guests can experience a traditional hot stone bath in the wooden tubs where water is heated with red hot stones burnt over an open fire. The stones are collected from the Paro river beds. Local herbs are added to give medicinal value and fine aroma. Next to the hot stone bath house is the massage room where experienced masseurs will soothe your aching body.